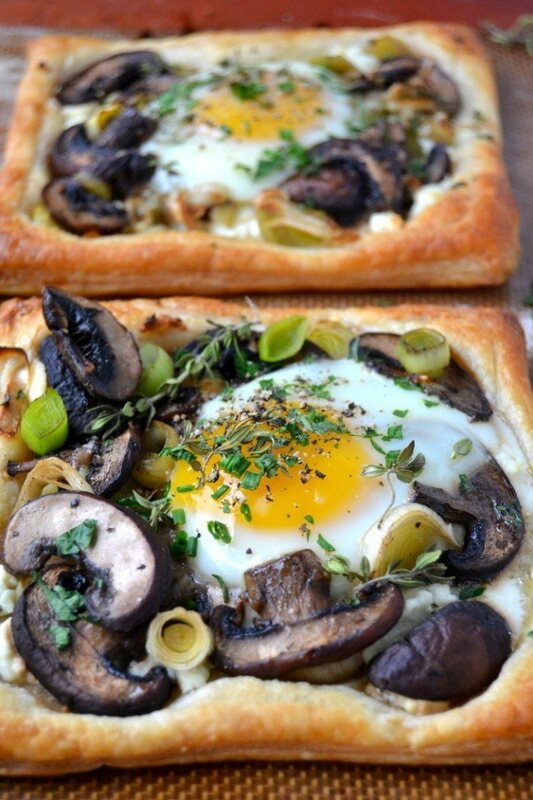 Mushroom and Egg Breakfast Pastries look fancy but they're easy to make using frozen puff pastry. They make an elegant presentation for brunch! Heat the olive oil in a skillet and saute the leeks and mushrooms for about 10-15 minutes until soft but not mushy. Toss with the fresh herbs. Roll out the cold puff pastry on a lightly floured surface to a 12x 12 square. Cut that into 4 smaller squares. Using the tip of a small paring knife, score around each square, being careful not to cut all the way through, just 1/4 inch from the edge, to form a frame. This outer edge will puff up during the baking like a crust. Use a fork to prick the dough all over, INSIDE the frame. This will keep the inside from puffing up. Brush each piece of dough lightly with heavy cream or a beaten egg. At this point you can refrigerate the dough and finish later, if you want. Spread or crumble goat cheese on each square of dough. Top with the mushroom leek mixture. Be careful to keep the mixture inside your 'frame', and make a small 'nest' in the center where the egg will eventually go. Crack the four eggs into individual cups and set aside. This is going to make it easier to slide the eggs onto the galettes later. Remove from the oven and make sure you have created a well in the center of each to hold the eggs. Then gently slide an egg into the center of each pastry. Put back in the oven for another 10-12 minutes until the egg is just set. Serve immediately, showered with a little more pepper, and fresh herbs.